"Phostint" card; Specifies one cent postage United States and Canada; Foreign two cents. 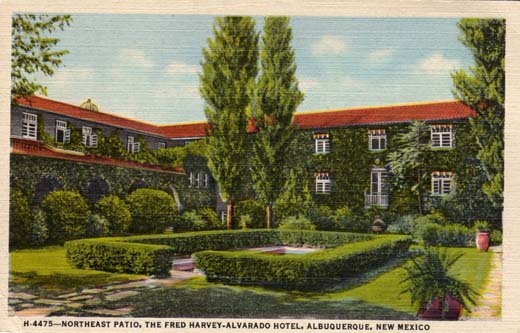 The Fred Harvey Hotel at Albuquerque was named after Hernandez de Alvarado, a captain of artillery in Coronado's famous expedition. Specially attractive features of the hotel are its delightful gardens and patios. 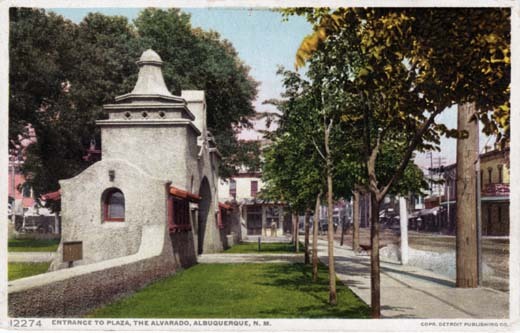 With its deep porticos, long arched corridors and inviting patios, the Alvarado Hotel at Albuquerque is a distinct achievement in carrying out the Spanish Mission style of architecture. 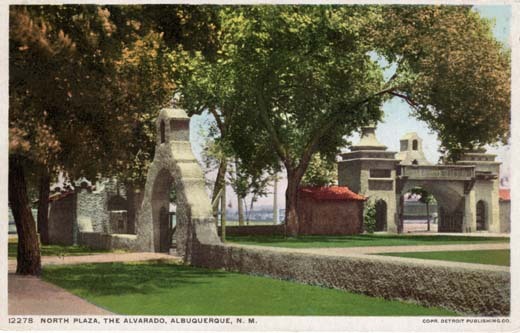 North Plaza, The Alvarado, Albuquerque, N.M.
With Coronado's expedition into the Southwest in 1540 there came one Hernando de Alvarado, who was captain of the artillery with the expedition. In memory of this man the Alvarado was named. 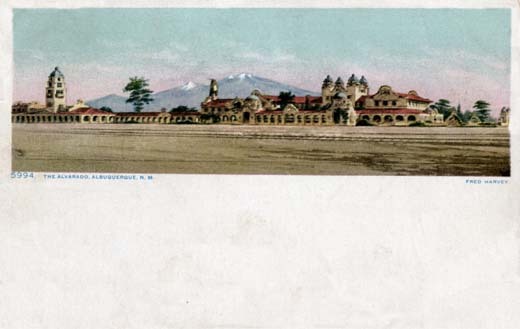 The building is modelled after the old Spanish missions, the wide spreading lawns and plaza, and the graceful lines of the building remind one of the days of Spanish chivalry. "Phostint" card; Specifies one cent postage United States & Canada; Two cents Foreign. 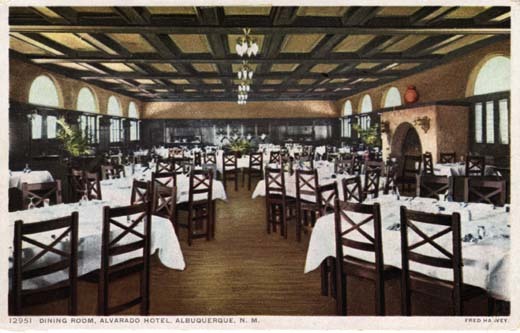 The Hotel Alvarado at Albuquerque, NM is of the old Spanish Mission style of architecture. The magnificent dining room is the largest room in the building. It will accommodate 160 guests. The dark oak beams of its ceiling contrast sharply with a background of rich yellow, and the great fire place projecting into the room gives an atmosphere of cheer. 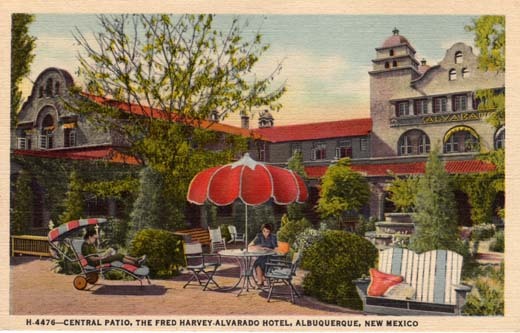 Fred Harvey's ALVARADO HOTEL on the corner of First Street & Central . . . 118 delightfully appointed air conditioned guest rooms . . . Located conveniently in downtown Albuquerque . . . Free parking . . . 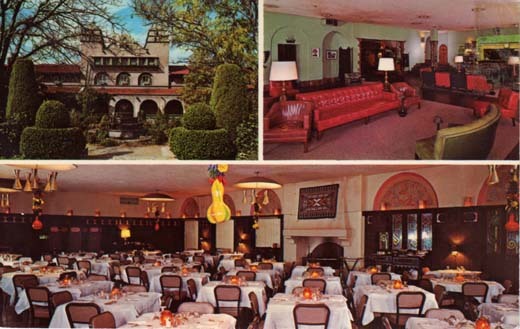 Delicious food in the tradition of Fred Harvey . . . Spotlight Room Cocktail Lounge . . . Beautiful grounds and gardens.